How many of us can claim to have the courage to pursue our dreams? The need for job security often overpowers our desire to venture into the unknown. Eventually, only a few of us manage to set out on this path and an even fewer actually succeed. Chandrapani Ramadoss was brave enough to take up this path, too. Despite working as an Engineer in a reputed multinational firm, he decided to pursue his interest. He left his job and enrolled for an MBA in Marketing. The fact that he belongs to a humble background makes it even more commendable. 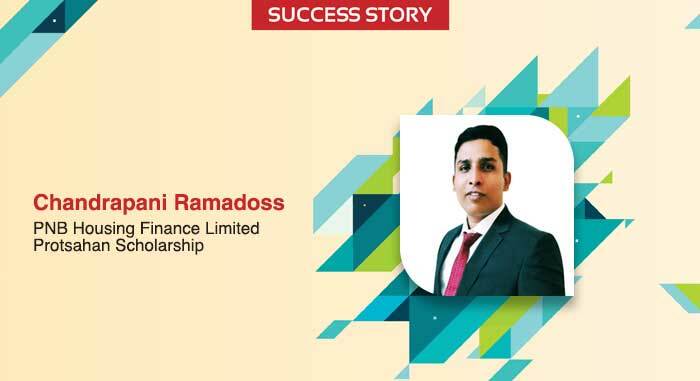 After facing financial struggles to take care of his educational expenses, Chandrapani managed to be selected for the PNB Housing Finance Limited Protsahan Scholarship. Our team had a conversation with him. This scholar success story has excerpts from the same. Buddy4Study: Tell us briefly about your academic and professional journey till now. Chandrapani: I am currently pursuing the first year of MBA in International Business (Marketing) from Birla Institute of Management Technology, Greater Noida (BIMTECH). My journey towards MBA has been an enjoyable and transformative ride. After completing my schooling (Class 10th) in Pondicherry, I pursued a diploma in Electrical and Electronics Engineering from the Motilal Nehru Government Polytechnic College, Pondicherry. Then I completed my engineering in Electrical and Electronics Engineering from SASTRA University, Thanjavur (Tamilnadu) where I was fortunately placed in TATA Consultancy Services Limited (TCS) through campus placements. My stint at TCS lasted 3 years before I joined BIMTECH to pursue my aspirations. Buddy4Study: What motivated you to choose Marketing as your field of specialization? Chandrapani: Pursuing higher studies in Business Administration was always in my wish list since my graduation days. The ‘80-20 Rule’ in Business Analysis always inspired me to pursue Marketing. The rule states that 80% of the results are because of 20% of the root cause. I wanted to be in the ‘20’ to bring that massive ‘80’ in my life, both personally and professionally. Moreover, during my tenure at TCS, I got a chance to interact with people from various geographies. I understood their queries and provided suitable solutions. It was then that my interest in marketing started growing. Also, ever since the evolution of humankind, marketing as an industry has always held a pre-eminent position, and perhaps, will continue to flourish till the time humans exist. The demand for this stream never slumps. Marketing impacts the way people live their life; this very thought motivated me to pursue this field of specialization. Buddy4Study: What difficulties did you encounter during the course of your educational journey? Chandrapani: Managing the finance for my education was the key challenge that I faced during my journey. I am from a family of four where my father was the only earning member. In addition, he also had to take care of my grandmother. By the end of Class 10th, even though I secured 84.6% marks, I had to pursue Diploma instead of Secondary School because of my family’s financial situation. After completing my graduation, I couldn’t directly pursue higher studies. I had to work for a few years to support my education and family. Even now, I have taken a loan to pay my college fee at BIMTECH. Chandrapani: My parents and brother have always been my source of inspiration through their valuable teachings. Apart from them, I have been constantly guided by my professors and friends throughout my life at different phases of my life. This inspired me a lot to move forward in my endeavours. Buddy4Study: Tell us a little about your family’s contribution towards your venture to pursue an MBA course. Chandrapani: My family’s contribution in my venture to pursue an MBA course is paramount. They have been supportive, both financially and emotionally, in motivating me in my decision to pursue MBA. My father (Ramadoss) at the age of 65 has ensured to take care of our day to day expenses. My elder brother (Madhusubash) has taken the responsibility of my educational expense since he started working. He was the one to pay my fees during Graduation and he still continues to pay the interest charges for my educational loan to pursue MBA. There are no words to express the encouragement provided by my mother (Kanchana). Buddy4Study: How did you come to know about the PNB Housing Finance Limited Protsahan Scholarship? What steps did you follow to apply for this scholarship? Chandrapani: I was informed about this scholarship by my college (BIMTECH). Further, there was an orientation session held in my college in association with Buddy4Study and PNB Housing Finance Limited. The process of application was simple. All we had to do was to upload the relevant documents on the Buddy4Study portal. Everything else was taken care of by Buddy4Study team. I was asked to attend a personal interview with PNB Housing Finance Limited after being shortlisted based on the documents submitted. Buddy4Study: How do you plan to spend the scholarship amount that you have won? Chandrapani: I am planning to spend the amount won on paying my future fees in BIMTECH thus reducing a great load of the burden from myself and my family. Buddy4Study: What goals have you set for yourself in the future? Chandrapani: My present goal is to join a consulting firm in a middle management role where I can apply my learning to the fullest and gain as much business domain/process knowledge as possible. In the long term, I would like to see myself in a senior management role where my decisions could impact the organization positively, providing value addition to both of us. Buddy4Study: How do plan to give back the support to the society that you gained from it? Chandrapani: Coming up from an agricultural family, I always wanted to invest my efforts on fighting water scarcity and preserving fresh-water resources. Also being an Electrical Engineer, I would like to spend my time on renewable energy resources. These are the two ways that I am planning to give back to the community. Buddy4Study: What advice would you like to give to the young ones who want to pursue higher education? If you want to find scholarships matching your needs, complete your profile with Buddy4Study and get timely alerts.